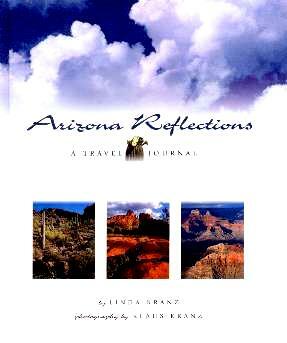 Upon selecting this particular book to review, I thought it was Linda Kranz's personal travel journal through Arizona. It's not. Instead, it's a well-thought out potential journal for anyone planning a trip to this stunningly beautiful state. She has scattered the most incredible photographs throughout the book, the pages have lines so you can record your own thoughts, and there are lovely quotes by well-known people on almost every page. Just the encouragement you need to keep a journal of your trip, especially if you don't know how to go about keeping a journal. There is even space for your own photos or sketches or postcards, or I guess, leaves or some such reminder. At the back of the book is a checklist of things to take along on your trip, a climate chart, and a sunrise and sunset chart. There are also many contacts should you require further information, such as the Chambers of Commerce and parks and monuments. Even if you've never kept a journal before, there are triggers for you such as "How we spent the day ...", "Today we drove to ...", and "Why we chose to come here at this time of the year...". All in all, a very novel idea for anyone going to Arizona. There's also a lovely satin bookmark. Conclusion - This would make a beautiful gift for the traveler in your life.